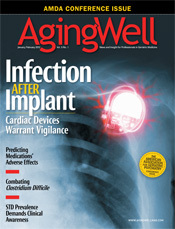 Although implantable cardiac devices save lives, associated infections warrant attention. Cardiovascular implantable electronic devices (CIEDs) such as pacemakers and defibrillators are often lifesaving for patients with heart problems. Yet the development of infection following an implantation procedure can pose a life-threatening risk to these patients. With more patients receiving these devices than ever before and the rate of infection increasing rapidly, a closer look at the burden of infection and its impact on outcomes for patients living with cardiac devices warrants further consideration. Though infection remains a rare complication, the concern lies in the fact that the rate of infection seems to be increasing at a faster pace than the rate of device implantation. While the number of cardiac devices being implanted has doubled since 1993, the number of associated infections has more than tripled, according to a recent study published in The Journal of the American College of Cardiology. During the time period examined in this retrospective study (1993 to 2008), more than 4.2 million such devices were implanted. The number of infections rose 210% over this 16-year span, from 2,660 cases in 1993 to 8,230 cases in 2008. In another recent study, published in the Archives of Internal Medicine, a link between CIED-associated infection and increased mortality and hospital care costs was further investigated. Depending on the CIED type, the adjusted length of stay was significantly longer for patients with infection. Authors noted that intensive care stays accounted for more than 40% of the incremental admission cost. Pharmacy services also contributed to a large portion of the cost. The second biggest factor contributing to high cost was IV antibiotics. “We think that if the management decisions are made quickly, including expedited removal of infected hardware and placement of a new device, these patients could be moved from critical care to a regular floor sooner, leading to shorter length of hospital stay and major cost saving,” says Sohail. There are essentially two types of infection that may occur following surgery for an implantable device. The first is a local infection at the operative site. “This type of infection usually presents early on and is called a pocket infection,” says Greenspon. The second, more serious type of infection in patients with cardiac devices is a systemic infection that occurs in the bloodstream and is also known as lead-associated endocarditis. In his research, Greenspon found that some patients developed this type of infection long after surgery. Giving the right antibiotics at the right time is another key element in infection prevention, says Sohail. Until 2009, there was a lot of debate as to whether antibiotics were really vital in preventing infection, but a study published in Circulation: Arrhythmia and Electrophysiology around that time demonstrated a huge difference among patients who received preventive antibiotics vs. those who did not.